A professional body shop that performs routine automobile repairs may provide auto glass installs or repairs. These body shops require that every driver with a damaged window have their car towed or brought directly to the shop. As a busy driver, you deserve a better option. PG North Hills auto glass repair technicians come directly to you using mobile auto glass replacement service vehicles. The ability to stay where you are after an accident is a security feature that will keep you safe. It is dangerous and against the law to drive a vehicle that has window damage. The safety of innocent drivers and your own safety should be put first. PG North Hills auto glass repair specialists arrive quickly to provide a free estimate and begin repair or replacement work on your automobile glass. One of the causes of damage to your automobile windows is from cars or trucks that are traveling in front of you. Most city or state work vehicles carry equipment or heavy machinery to each job. Sections of metal or debris are known to fall off and collide with car windows. PG auto glass repair in North Hills experts are aware of these problems and stand ready to respond when you have glass damage. A hard rain can blow dust, dirt or hail onto your automobile making your drive to work or home dangerous. Driving in these conditions usually brings some type of damage to your automobile glass and can lead to sudden breakage. You cannot drive with a busted windshield and having a professional source like PG auto glass repair in North Hills technicians is important. Not every window can be repaired when it is broken or cracked. Finding North Hills auto glass replacement after business hours may be a challenge you are not prepared to take. Being prepared in advance will help save you from lost time and money when you have an emergency with your automobile glass. 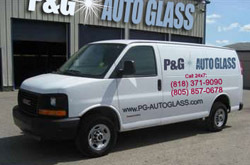 A single call to PG auto glass replacement in North Hills experts will solve your problem 24/7. Do you need an auto glass replacement services in North Hills, CA in zip codes 91343 or 91393? Contact PG Auto Glass to receive fast and quality services.